"Also delicious with sliced grilled chicken!" Melt Spread in large nonstick skillet over medium-high heat and cook chicken, in batches if necessary, stirring occasionally, until chicken is thoroughly cooked. Remove chicken and set aside. Stir Sauce and broccoli into same skillet. Bring to a boil over medium-high heat. Reduce heat to low and simmer covered, stirring occasionally, until broccoli is heated through, about 5 minutes. Stir in chicken and cook, stirring occasionally, until heated through, about 2 minutes. Serve over hot fettuccine and sprinkle, if desired, with grated Parmesan cheese. The sauce makes this dish. It's very tasty. Will definitely be making this again. Again, I'm sure it's my cooking, but it came out so dry. I added more milk, but still needed a lot more. Otherwise, it could have been a tasty dish. I made this dish firs the first time and my family and I loved it. I had never tried chicken & broccoli alredo. I will definately be making it again. This was the first time I ever made this dish and it was absolutely great. I gave some to my daughter in law and she loved it. I didn't change anything in the recipe. Made this with penne pasta instead of fettuccine it turned out great! Everyone loves it, seasoned the chicken while it cooked and used Prego sauce! Definitely will make it again! 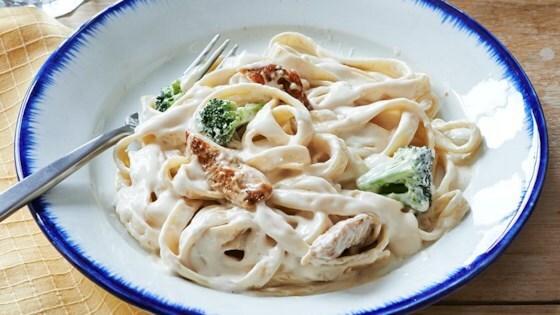 I made my own alfredo sauce from scratch. So good!! I loved it!